Weather is always tricky around Memorial Day. It usually rains, temperature fluctuates 20 degrees, and sometimes the sun shows up. The best advice is to plan for layers! 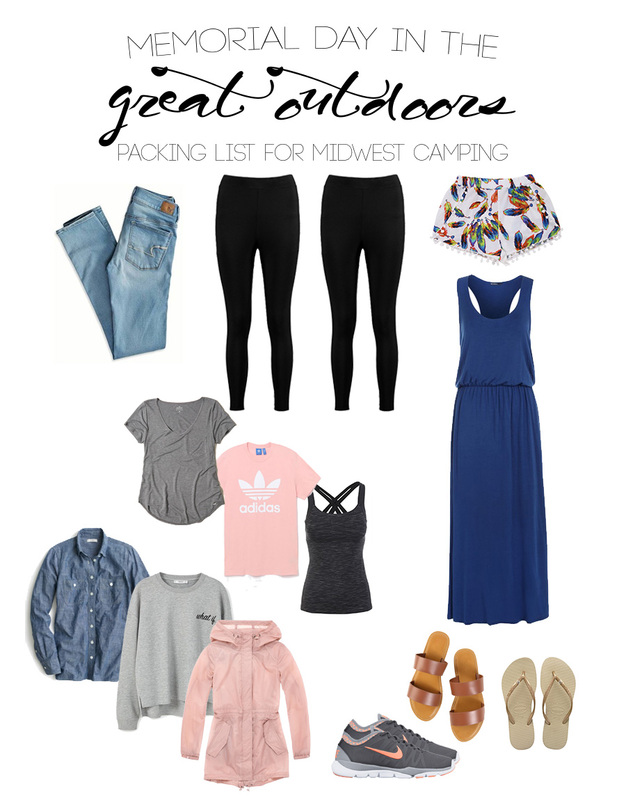 A three-day weekend of camping calls for a pair of jeans, a couple pair of leggings (great to sleep in as well), and one pair of shorts. A few lightweight shirts that can sit comfortably under a chambray top, a sweatshirt, a raincoat or all three if weather gets really crazy! Tennis shoes are my shoe of choice for walking around a campsite, but if it's really warm, I always want to slip on some sandals. Of course, flip flops to wear in the shower are the most important. Lastly, I like the option of throwing on a sundress or a maxi dress if the sun plans to be out all day and we are taking it easy. It's also easy to top of off with the chambray top if it gets chilly in the evening.